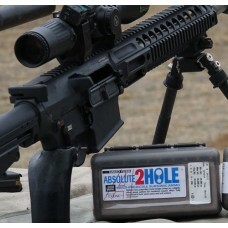 ABSOLUTE 2-HOLE is a radical advancement in extreme impact subsonic ammunition. Our 2-HOLE SUBSONIC ammo features TWO specially configured projectiles having a combined total weight of over 350 grains. These bullets impact in very close proximity to each other, delivering dramatic results. Designed to function and fully stabilize in a .308 Winchester based semi-auto platforms with no modifications. This means that you can shoot subsonic and supersonic loads out of the same magazine with no other special considerations. Projectile lengths are optimized to be compatible with 1-12 and faster twist rate barrels. The front bullet is designed to shoot smaller groups and is assigned the designation of the ammunition's "zero". The trailing, second bullet is constructed as a wadcutter/full-diameter/open-tip. When looking at groups on the target it is easy to distinguish each bullet's impact. Subsonic velocities are assured in a wide range of environments due to the temperature-insensitivity of the propellant and the precise propellant charge weight. 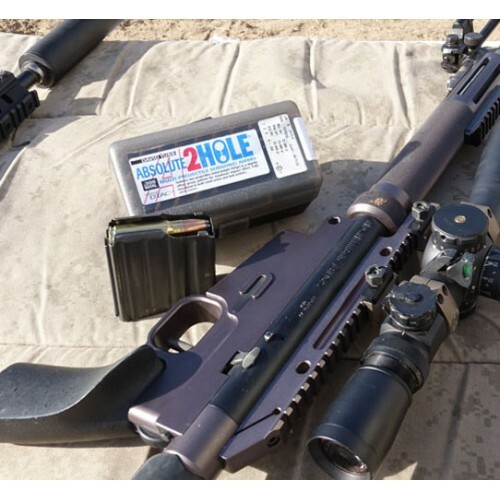 We have tested 2-Hole in longer-barreled bolt-action rifles and have loaded this ammo to what we consider maximum, reliable subsonic velocity. That means 2-Hole projectiles will have maximum energy available, while remaining subsonic at the muzzle. 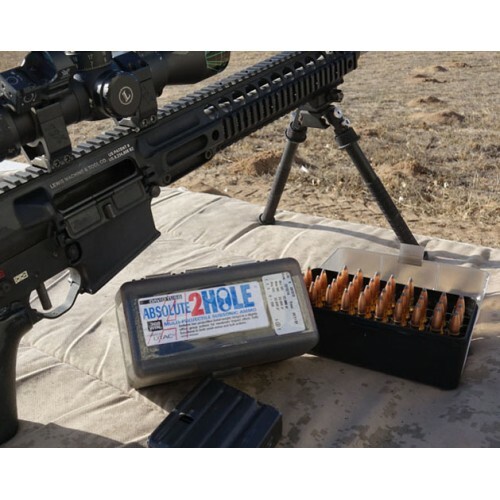 We have tested this ammo in various semi-automatic firearms based on the AR-10/SR-25 platforms. Function has been flawless in nearly all gas-impingement operating systems without any system modifications. In the case where the rifle doesn't cycle properly, we have found that the installation of our Flatwire Buffer Spring easily solves the problem. The reason is that the conventional round-wire springs that come standard in these rifles exert excessive load at position two (bolt to the rear). Our Flatwire Buffer Spring has less resistance in this portion of the cycle, although it provides greater cycling efficiency throughout the stroke, and also exerts higher spring load when the bolt is closed (position one). If you encounter any cyclic function issues, call us, provide your Ammo Lot Number, and we will offer you a special deal on a Flatwire Buffer Spring. Supressors that do not have passages that relieve gas pressures symmetrically as the bullet passes through it may pring two groups based on the non-symmertrical pattern. When fired from a semi-auto, the deflecting rear bullet pressure becomes a non-issue since the semi's bolt is opening upon firing, thus relieiving the internal pressure and the gas deflection of the trailing bullet. -Shipping regulations require that all ammunition must be shipped UPS ground. -It is the buyers responsibility to know their local rules and regulations in regards to ammunition. While we try to keep up with each state we cannot keep up with each individual ordnance.